BRUNCH. Some call it a Southern Institution. We call it a Weekend Necessity! These Carmel Crème Brûlée French Toast Cups will not disappoint! I’ve made these time and time again and everyone goes back for seconds. The creamy Carmel paired with the hints of cinnamon and nutmeg are the perfect combination. These drizzled with a bit of praline syrup or a bit of warmed Carmel sauce, words can’t even begin to explain how heavenly these are. Pre-heat the oven to 350* and line your cupcake pan with liners. 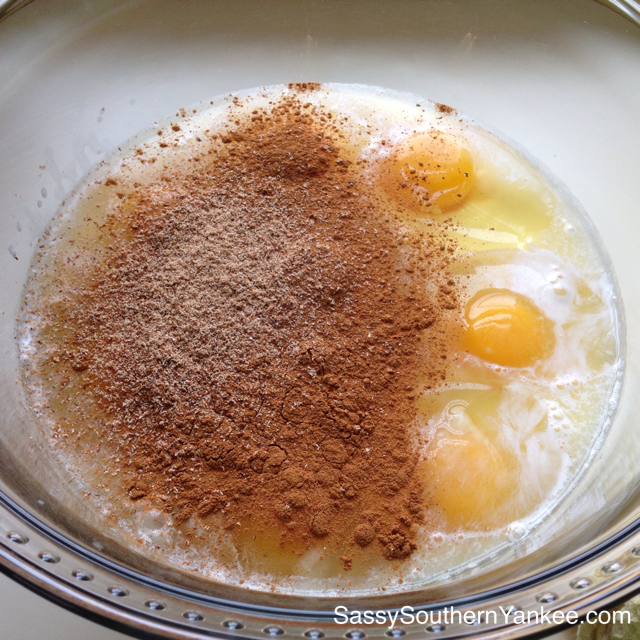 In a large bowl combine the eggs, non dairy creamer, brown sugar, cinnamon, and nutmeg. Whisk together until the mixture looks rich and creamy; set aside. Time for the bread! Slice the bread into 1/2 inch pieces then cube so that each piece is 1/4-1/2 inch square. If you are looking for a bit of a more rustic look you can tear the bread into pieces but lord knows I don’t have the patience for that. Once the bread is cubed add it to the egg mixture and drizzle the melted butter over the bread. Gently toss the bread in the egg mixture until each piece is evenly coated. Allow the bread to “rest” in the egg mixture. This allows the bread to absorb all of that delicious Carmel Crème Brûlée flavor. After allowing the mixture to rest give it one more good toss. Now using your hands (or a spoon if you don’t like getting messy) take handfuls of the french toast mixture and fill the muffin liners to the top. I like to fill them and allow the bread pieces to fall where they may it creates a fun staggered look plus its great at holding all of that delicious syrup in the crevices! Bake the french toast cups in the 350* oven for about 25 min or until cooked through. Allow the Carmel Crème Brûlée French Toast Cups to cool slightly before serving. 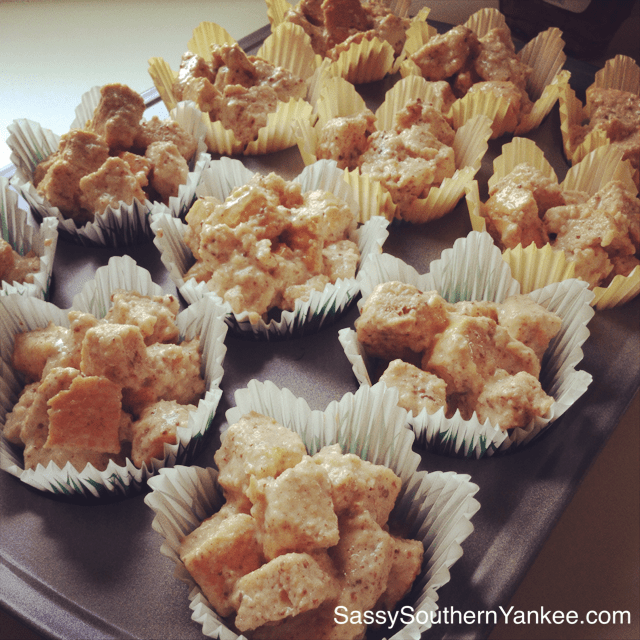 I love to serve these with a bit of praline syrup; however fresh caramel sauce is delicious too! You can make these ahead of time and warm them up right before serving. They also work great for breakfast on the go during the week. BRUNCH. Some call it a Southern Institution. We call it a Weekend Necessity! These Carmel Crème Brûlée French Toast Cups will not disappoint! I've made these time and time again and everyone goes back for seconds. The creamy Carmel paired with the hints of cinnamon and nutmeg are the perfect combination. These drizzled with a bit of praline syrup or a bit of warmed Carmel sauce, words can't even begin to explain how heavenly these are. Time for the bread! Slice the bread into ½ inch pieces then cube so that each piece is ¼-1/2 inch square. If you are looking for a bit of a more rustic look you can tear the bread into pieces but lord knows I don't have the patience for that. Once the bread is cubed add it to the egg mixture and drizzle the melted butter over the bread. Gently toss the bread in the egg mixture until each piece is evenly coated. Allow the bread to "rest" in the egg mixture. This allows the bread to absorb all of that delicious Carmel Crème Brûlée flavor. After allowing the mixture to rest give it one more good toss. Now using your hands (or a spoon if you don't like getting messy) take handfuls of the french toast mixture and fill the muffin liners to the top. I like to fill them and allow the bread pieces to fall where they may it creates a fun staggered look plus its great at holding all of that delicious syrup in the crevices! Bake the french toast cups in the 350* oven for about 25 min or until cooked through. Allow the Carmel Crème Brûlée French Toast Cups to cool slightly before serving. I love to serve these with a bit of praline syrup; however fresh caramel sauce is delicious too! You can make these ahead of time and warm them up right before serving. They also work great for breakfast on the go during the week. This entry was posted in Breakfast and tagged Carmel Crème Brûlée French Toast Cups, Cinnamon, Dairy Free, Eggs, French Bread, Gluten Free, Non-Dairy Creamer, nutmeg, Sugar. Have you ever made this as an overnight recipe? Would it get too soggy if left to rest overnight? I have made it as an overnight recipe, and it was just fine. When I make it overnight I do make it in a casserole dish because I found it tends to stick to the paper muffin liners. It’s perfect as a holiday morning breakfast. I recently made it the night before in a 9×13 pan and popped it in the oven an hour before my niece and nephew went to school they were in heaven!